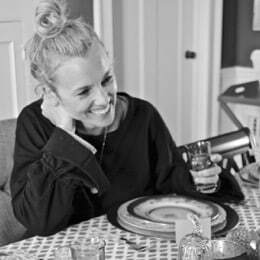 Disclosure: Sometimes it takes a village to pull of a room reveal and this is no exception. 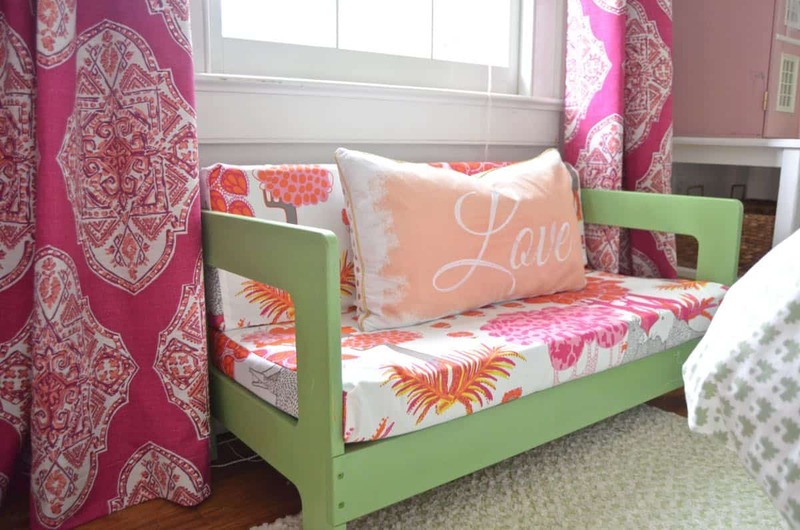 I had some help from the AMAZING folks at Lacefield Designs who sent along the fabric, BoomBoom Prints generously gave Eleanor the custom colored print and Americana Decor let me check out their flawless chalk paint. A million gold stars to everyone! 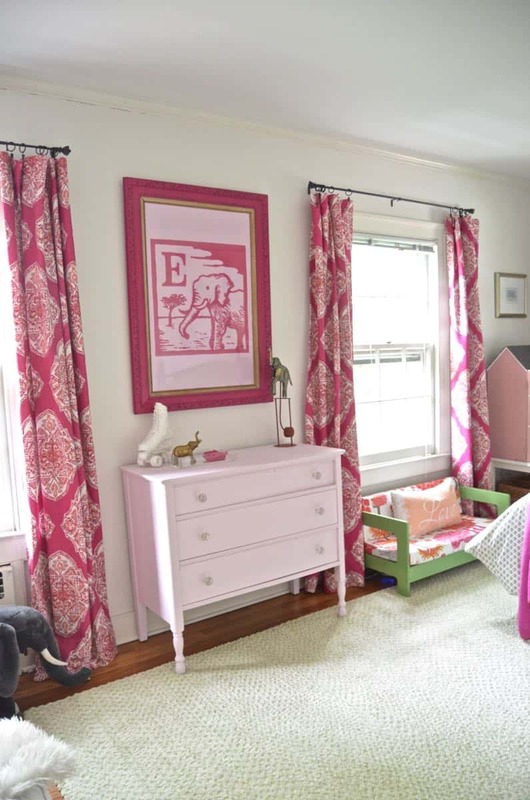 If you had told me six years ago that I would be designing a FUCHSIA bedroom… I would have cringed. And balked. But mostly cringed. Well, today… my daughter and I are THRILLED by her new amazing bedroom! 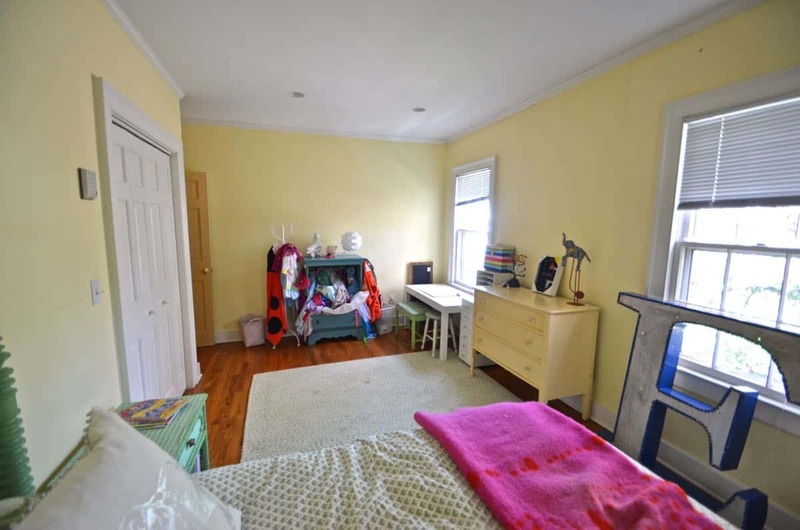 In the old house, Eleanor shared a room with her brother. When we told the kids we were moving, I was most worried about Eleanor and her attachment to the old house. To help ‘sell’ her on the new house, we spent some time talking about HER room. Kinda sorta bribery. Well, it worked! She started thinking about what sort of things she’d like in her room: fuchsia, a fancy mirror, and a big bed were a few items on her rider. She also asked for a canopy and a fancy chandelier. Can’t please ’em all. Reminder that this was how the room looked before. Yellow. And random. I didn’t want the room to be allllllll pink, so I kept her pretty green bed as is (Geranium Leaf by Behr) and painted this old wooden loveseat I picked up at the flea market. I recovered the fabric with this fun pattern I grabbed “for later” at Ikea months ago. The colors work perfectly! The dresser got a coat of the prettiest pale pink (Promise) that the kind folks at Americana Decor sent over… not too bright, not too light. Went on like a dream and takes the edge off the bright pink curtains. It’s hard to miss that fun graphic print, right? I worked with the folks at BoomBoom Prints to bring in something fun and graphic and… “E For Elephant” is perfection. Both colors can be customized so naturally Eleanor chose pink on pink. (I tried to make a case for a white background, but Ms. Pinktastic was having none of it.) 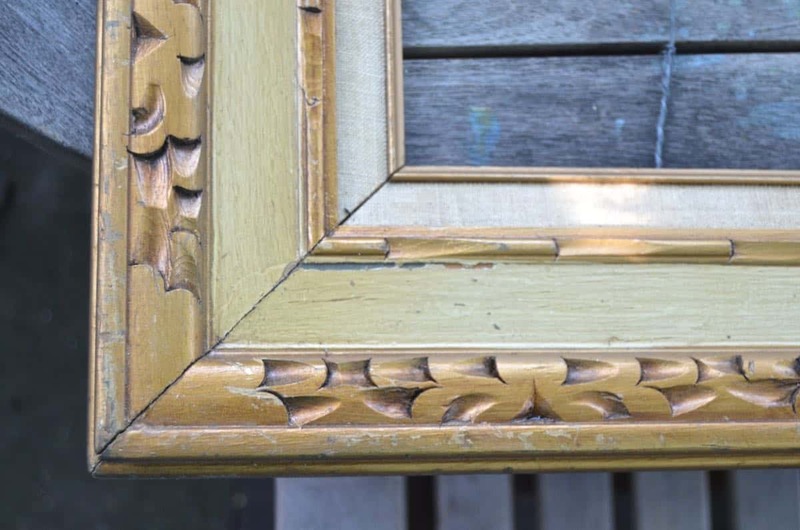 The frame cost me $10 at the flea market- $5 for the lovely outer frame and $5 for the glass. 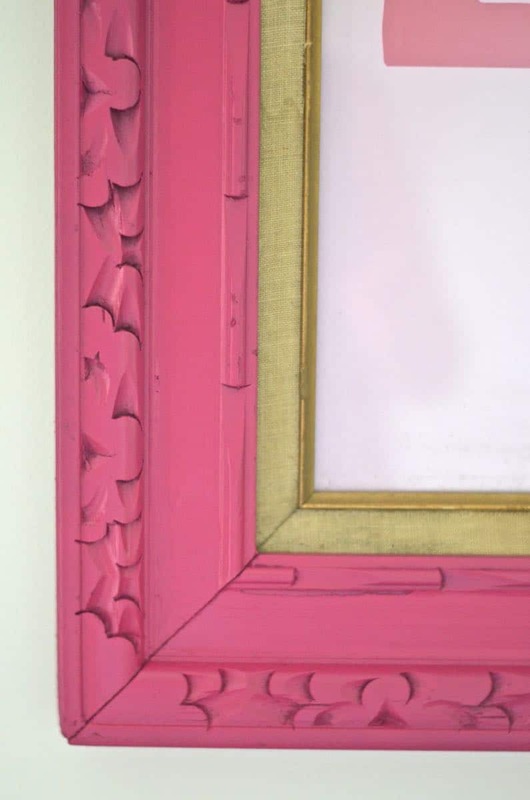 I gave her a coat of this amazing new Magenta color from Rustoleum and it’s such a statement! 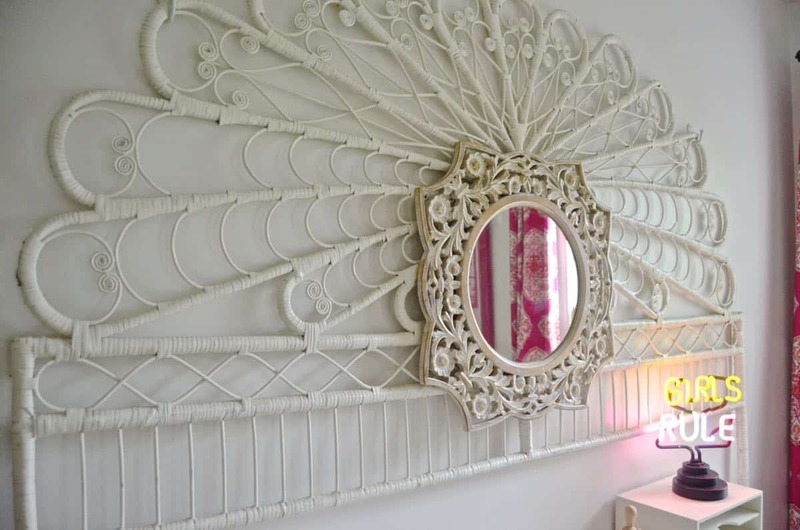 A wicker headboard I picked up a year ago hangs on the wall (again I make the case for a good solid furniture hoard), and her requested ‘fancy mirror’ is layered right on top. The killer MCM (mid-century modern) desk seat was $30 at the flea market and I simply gave it a coat of Rustoleum’s vinyl spray paint… these kids climb and jump all over the seats so a shiny vinyl surface is perfect! I can reupholster when everyone is past the parkour stage of play around here. 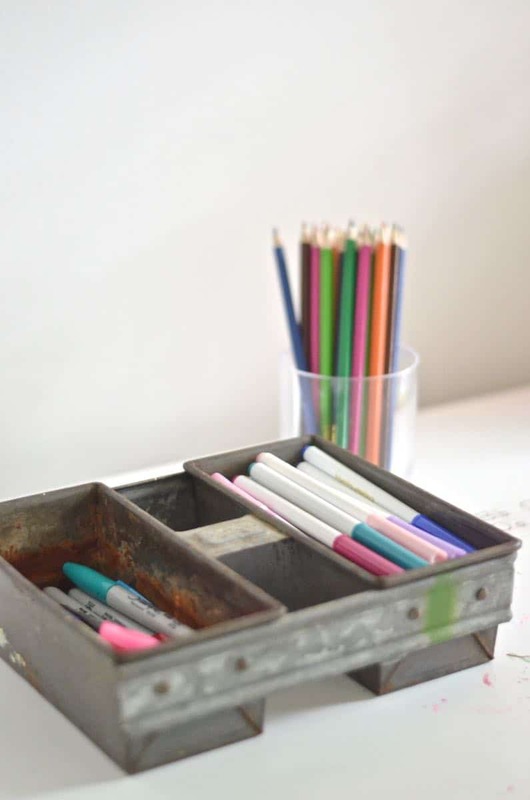 I always love to have fun with accessories in a room like this… for her desk storage, I found this fun bread pan at the flea market to corral her many MANY pens. 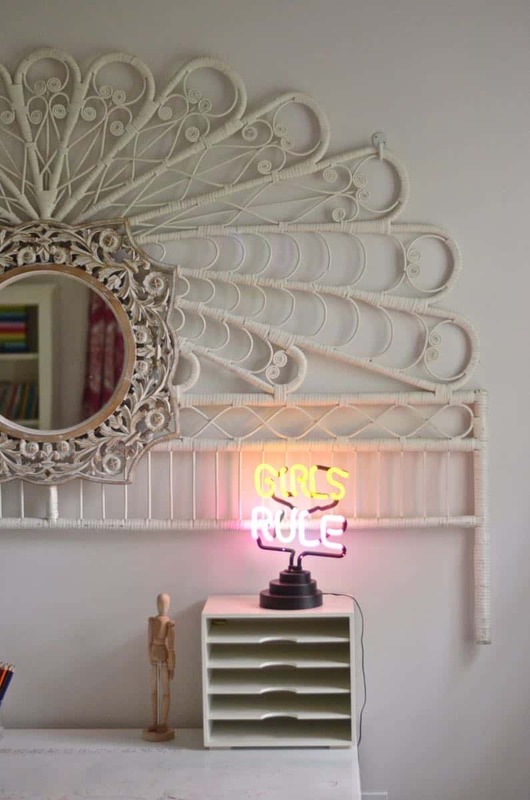 The Girls Rule sign was another amazing flea market find. Throw pillows, door hooks and fun quote are from Homegoods and the paper unicorn and light up E were the results of my first ever trip to a Hobby Lobby. Oh! I didn’t get a fancy chandelier for her, but this white ceramic floral lamp is everything. Ten dollars. TEN!!! Like, what?! Are you seeing pink yet? Yeah… I know. It’s a lot. But you know who LOVES it? Eleanor. She just beams every time she goes in there which makes all the painting and flea market schlepping totally worth it. 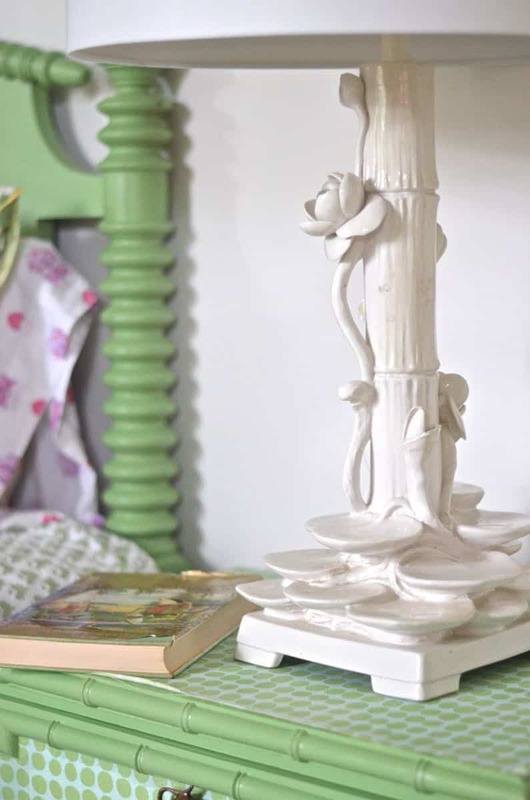 My childhood bedroom furniture was mostly amazing… A set my mom picked up at a tag sale that included a canopy bed (my favorite part), nightstands and a dresser…. but the carpet in my bed room (from previous owner’s) was LIME GREEN AND YELLOW SHAG!! We didn’t have the $ to replace it so my mom spent years covering it with rugs that looked terrible due to the texture of the carpet and the fact that EVERY.LITTLE.RUG clashed with that hideous carpet! 🙂 Aaaaahhhh, the memories! Sorry for the delay! I’ve been away all weekend…my daughter wanted a canopy bed. :/ Next time!! That carpet sounds hilarious. Like Jon Deere designed the room! Eleanor’s room is beautiful! 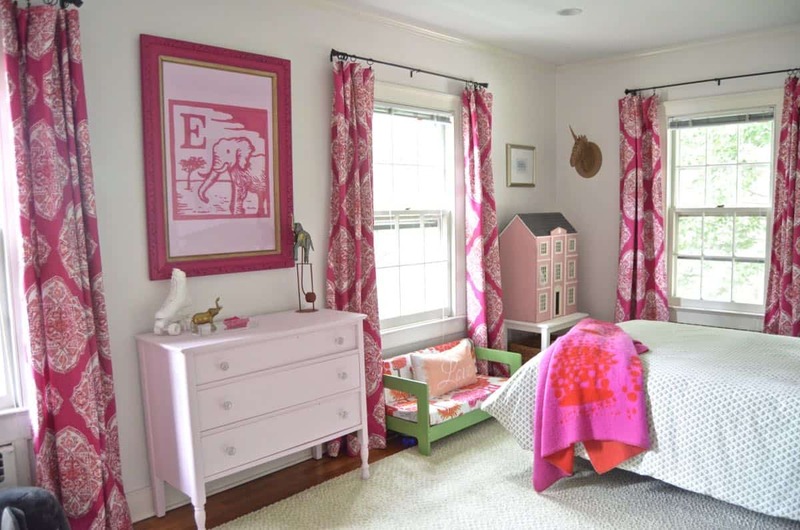 As the mother of only sons, I would have loved to have a pink room somewhere in the house. Hopefully I will get a granddaughter some day and she will love pink. I don’t even have a delicate cycle on my washing machine. My childhood bedroom was pretty amazing, I had a very small bedroom but my mother bought me the prettiest pink/flowery comforter set that made the bedroom just come alive. I had one duvet cover I made from the prettiest fabric… pretty sure I had it all through college and it made the room seem SO much homier and light IMHO. 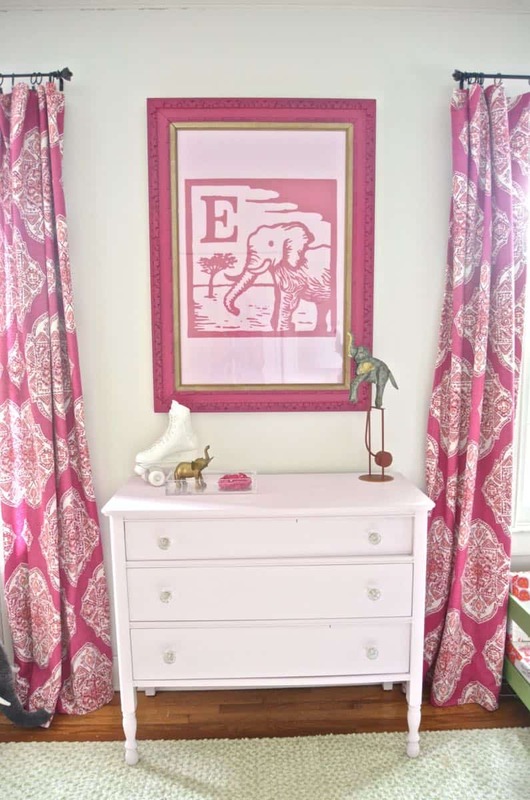 My childhood bedroom was very pink. 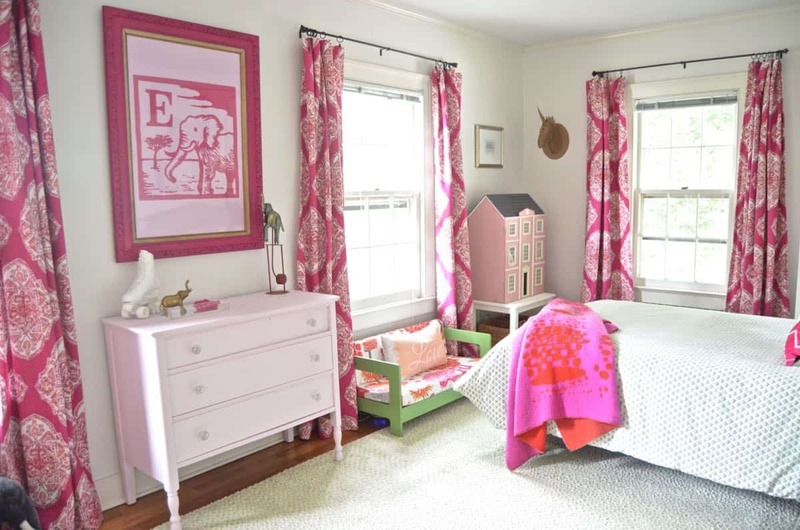 Pink walls, pink gingham bedspread and shams. All of the furniture was flea market finds. Brass bed, old oak dressers. I actually still have all of them today. The brass bed is currently in the closet but maybe someday I’ll use it again. The dressers I still use every day and I’m way old now! Your bedroom redo is lovely. I love all of the colors. Haha. “Way old” made me laugh. And send the brass bed my way… love it!!! Sounds like a sweet room! My much younger sister and I shared a room growing up. I had this fabulous small solid wood desk that I wish my parents still had so I could snag for them. We moved in to their current house when my mother was pregnant with her. When they started redoing the rooms they let me pick out the wallpaper, curtains, etc. (from their selections – but being as young as I was I felt like I was important.) and we ended up with dusty rose colored drapes and blinds with wallpaper which was white with loads of tiny pink roses all over it. 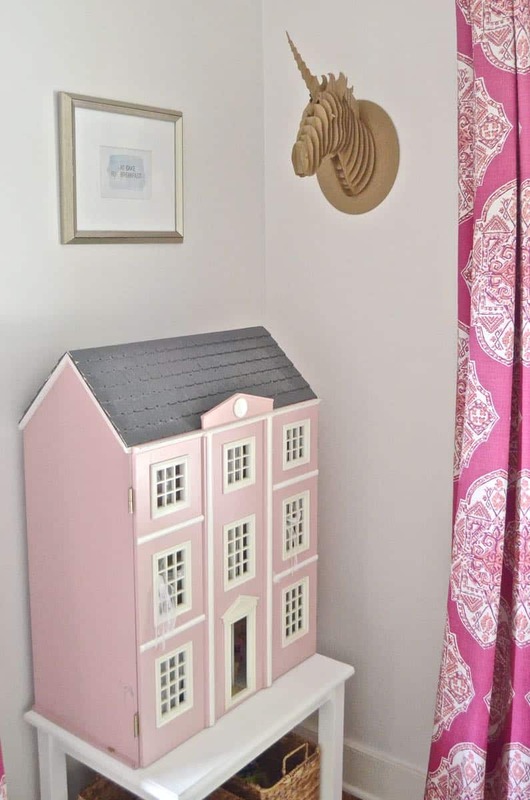 It felt very girly and grownup to me at the time – until I hit an anti-pink/anti-wallpaper stage. That wallpaper and the blind are still in that room. My grandmother recently made me a quilt. When she asked me what colors or patterns I wanted I only mentioned one color I am not fond of, but asked her to go with her guts and pick out what she likes or what made her think of me. My parents recently came to visit with my new quilt in tow – the back is a gorgeous white with pale pink roses. 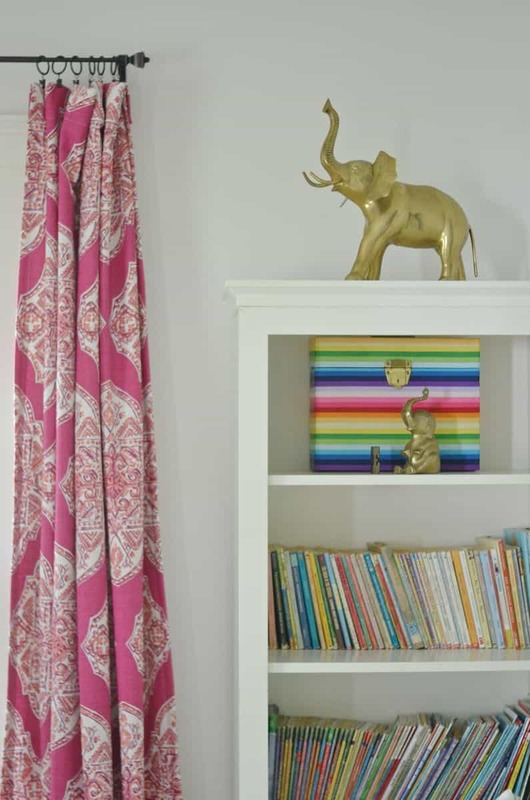 Without realizing it she picked out fabric which is very close to that wallpaper I picked out twenty-some years ago. No WAY!!! SHe must just associate that with you! 🙂 Sweet, really… hope you can find a space for the new quilt. I definitely had memories like that where something that seemed SO grown up lost its luster for me!! Beautiful! Just enough fuchsia without being too fuchsia! 🙂 Thanks! And yeah…. hopefully ‘juuuust’ enough! We had Muppet baby wallpaper and bunk beds my parents built. My sister and I shared our room which was tiny, but I loved it. Once again, you’ve knocked it out of the park with the her room. I love it! I love that you included her in all the decisions even if it’s too much pink, it’s her. Great job! Thanks, Jenna! Love the muppet wallpaper… classic! My childhood bedroom was covered in teddy bear wallpaper. When I was about 10 I wanted something different so my mom and I got to work stripping off all the wallpaper. Little did we know we were actually also pulling off the paper of the drywall! Oops! My dad ended up re-drywalling the whole room. Love the re-do! So updated and fun! Aren’t they?! Thanks!! Love everything by Lacefield Designs. Looks great! 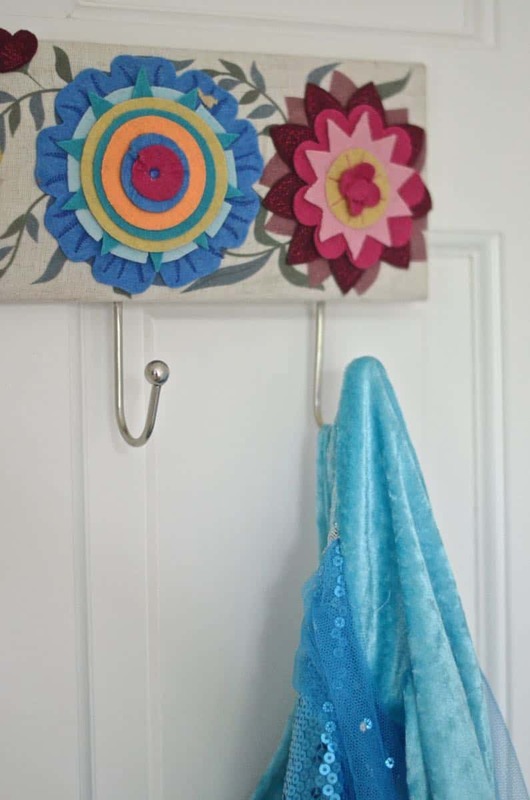 This is fun inspiration for me as we get ready to move into a new house and I plan out the kids rooms. I don’t remember there being very much decor in our bedrooms as kids, but I do remember a really big rug in my first bedroom. It was really colorful, and great to play on instead of the hardwood floor. This room is AWESOME! 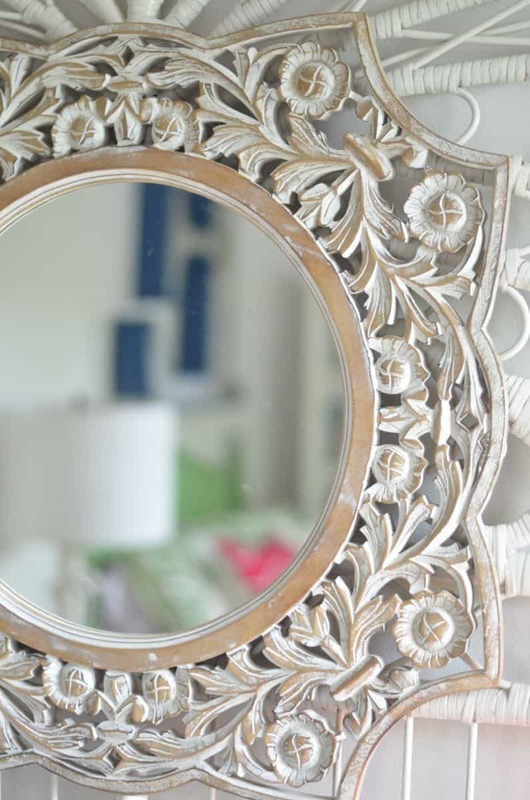 I love what you did with the headboard turned fancy mirror…so creative! My childhood bedroom was covered in floral prints and cherubs, my mother had a thing with themed decor. I had a white ornate daybed and bamboo dressers. That is all I can remember about my room, it was pretty and very mature for a little girl, but I loved it! That sounds so classy! Love the idea of white and pink with some black thrown in. Good luck with your room, Brenda! My bedroom was originally teddy bear themed? I don’t know. Not my idea. The carpet was blue and I thought it was “water” and would float myself and my, approximately ten billion, stuffed animals around on pillows so we wouldn’t drown. It was an intense game of survival. Besides being a typical childhood mess. My mom always went out of her way to paint my beds. AND of course I had to scratch in my name into them, since my name is so cool, haha! Which is why I love the print that emphasizes her name. Hopefully Eleanor won’t be scratching her name into anything! 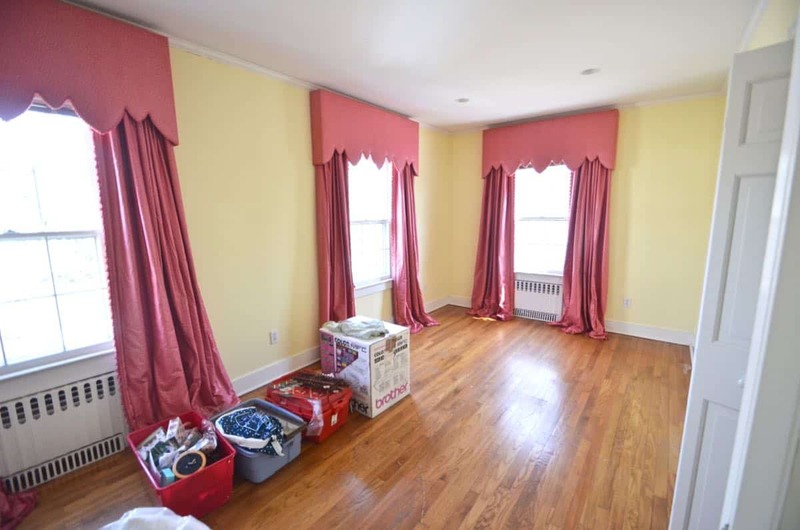 1) I had forest green carpet and pink/green “bubble” valances. Pink mini blinds. What was my mom thinking? 2) I did not know there was such a thing as vinyl spray paint! I have that exact same bench and was debating on how to fix it up. Spray paint to the rescue!! I had a day bed at in my childhood bedroom – those were quite popular then! 🙂 And lots of pink and dolls. This room looks great! This is a very nice room. I like the color combinations. The way you incorporated the fuchsia it can be easily changed in the coming years as tastes change. What is the name and brand of the gray paint you used on the walls? I reread your post but I did not see it mentions. Kind Regards. 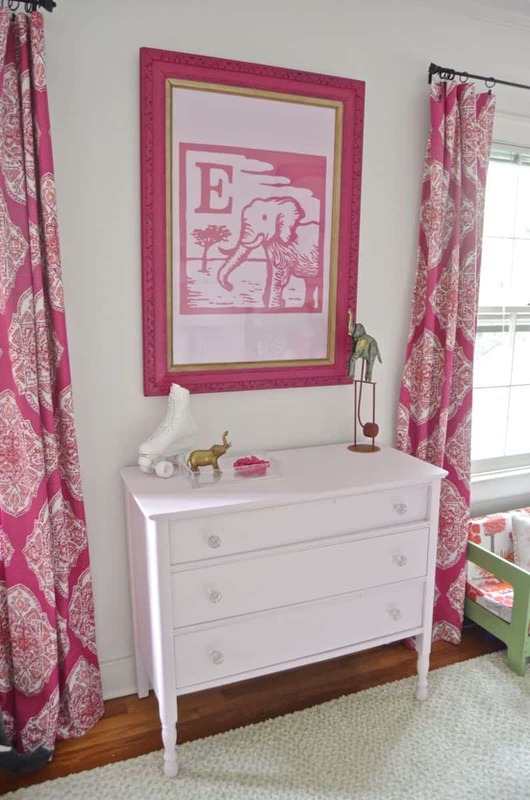 Hi Charlotte….your daughter’s room is darling! You did a wonderful job of balancing your color scheme. I don’t think there is too much fuchsia at all. Painting the walls a light gray really brings everything together. May I ask what brand and color the walls are? Such a beautifully neutral and brightening tone. Thanks for all the pictures! Hi, Just wondering about that BIG E!!! I love it! Please tell me you made it or bought it somewhere that makes them..
HI! 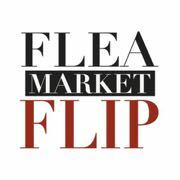 I’m afraid I don’t have a great answer for you… flea market. 🙁 I will say etsy has them occasionally, and I’d set up notifications on eBay. They’re big but super light so shipping will be expensive, but hopefully not crazy if you ever find one. Wish I had a better answer for you! Eleanor’s room is stunning! 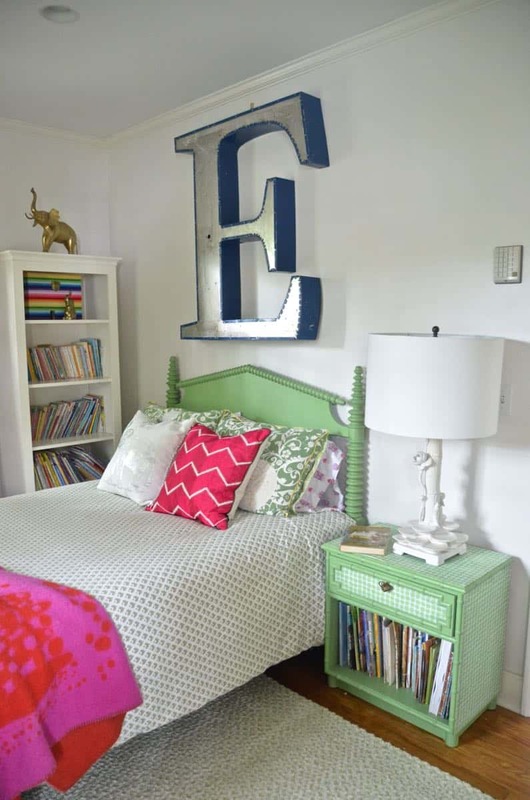 Can you tell me about the large, blue L in her room PLEASE! Hi Ilesa! That was an early flea market score! Try places like etsy… they often have similar industrial letters! Good luck!